This topic will guide you through the usage of the column headers, their customization as well through performing different data operations. Usually the top cell of a column is called Header. Its purpose is to set a caption for the column, which describes the data displayed in it. To set value for the header use the Header property of the column. The Header property is of type object and you are not limited to just using plain text. For example, you can add a corresponding picture to be displayed as header. Header Row - it is modified by setting an appropriate style as HeaderRowStyle of RadGridView. To learn how to style it take a look at the Styling the Header Row topic. 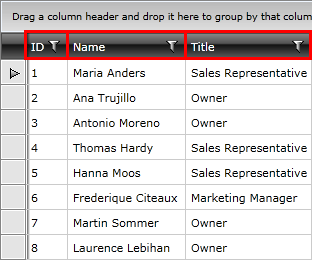 Header Cell - it is styled by setting HeaderCellStyle for the column, which means that for each column you can have a differently styled header. 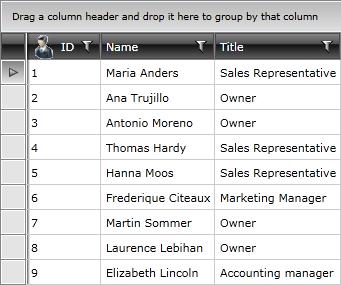 To learn more about how to style the header cell take a look at the Styling the Column Headers topic. Column headers can only be hidden by setting ShowColumnHeaders property of RadGridView to False. The header of the column plays the main role when we want to sort it. It also hosts all the visual logic around this functionality. When the data is sorted by a column, its header changes its appearance and shows the sort direction via an indicator. 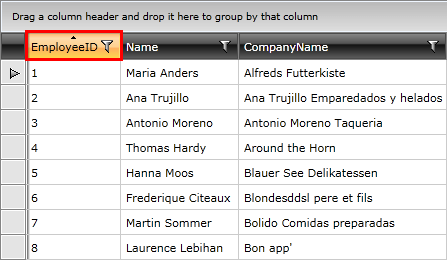 As of Q2 2013, the user can benefit from Column Sort Sequence Indicator. In order to have this feature enabled you need to set ShowColumnSortIndexes property of RadGridView to True. To learn more about the sorting functionality take a look at the Basic Sorting topic in the Sorting chapter. 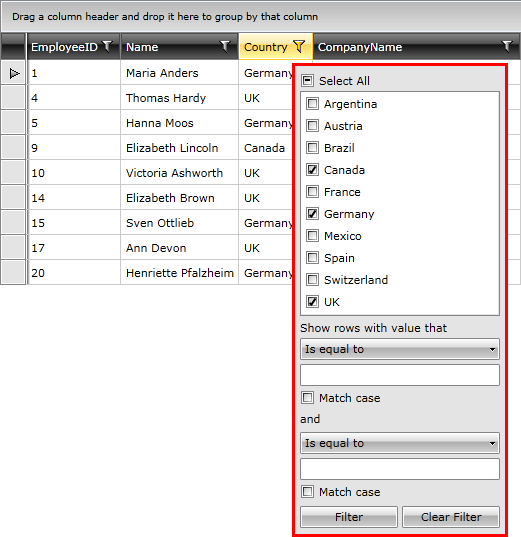 The header of the column hosts the built-in filtering mechanism, which allows you to filter data by the columns' values. To learn more about the filtering functionality take a look at the Basic Filtering topic in the Filtering chapter. The header is also used for grouping data. It has to be dragged into the group panel at the top of the control in order to get the data grouped by that column. To learn more about the grouping functionality take a look at the Basic Grouping topic in the Grouping chapter. 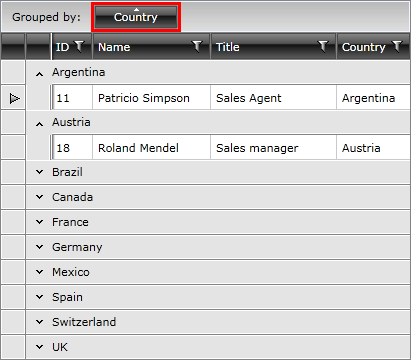 Columns in RadGridView can be grouped in column groups(added with Q3 2011). Read more. To learn more about the customizing of the headers please refer to the Customizing the Headers section above. As of Q2 2016, GridViewHeaderCell exposes TextWrapping, TextAlignment, TextTrimming and TextDecorations properties. These customizations can be also applied on column level through the HeaderTextWrapping, HeaderTextAlignment, HeaderTextTrimming and HeaderTextDecorations properties. 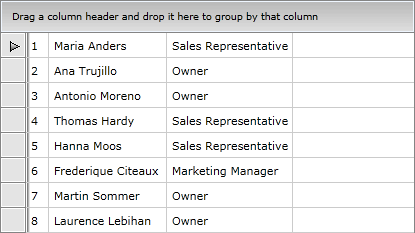 If the same property is set to both elements, the value of the one corresponding to GridViewColumn will be respected. Note, that the first column has a HeaderCellStyle defined, which aligns the content of the HeaderCell to the left, but the Style is not applied, as the HeaderTextAlignment of GridViewColumn is also being set.